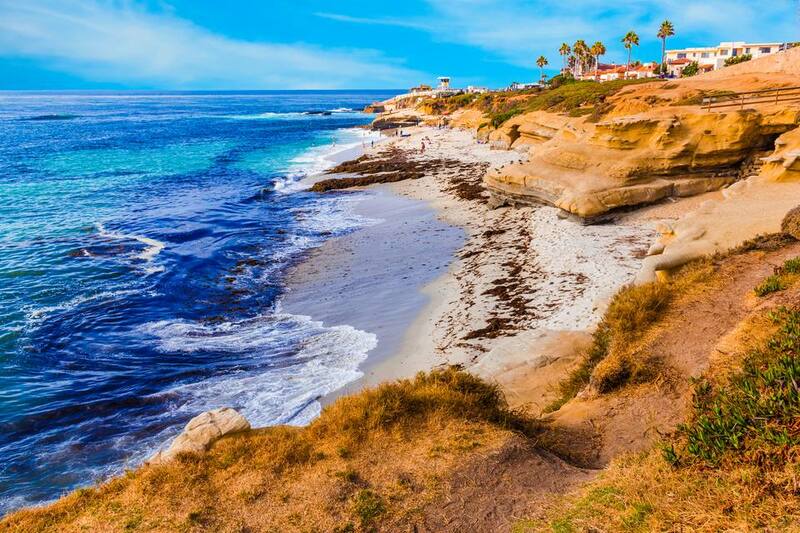 This photo guide takes you on a walking tour around La Jolla, California. You can use it to plan your own tour - or just enjoy the scenery from your comfy armchair. Your tour starts in front of the entrance to La Jolla Caves. This long-time La Jolla site is hardly worth the price of admission. Walk between the Cave Store and the fence and along the cliffside path to see where the cormorants hang out. These fish-eating birds do not have waterproof feathers, so you'll often see them spreading their wings to dry. They nest on the cliffs to get away from predators, and you can walk here to get away from most of the other tourists in town. Back at Coast Blvd., walk along the sidewalk toward Ellen Scripps Browning Park, the one with the green grass and palm trees. Here, you can walk down a flight of stairs to La Jolla Cove. This is one of the most photographed beaches in ​southern California, and it's easy to see why. The sandstone cliffs here make for dramatic scenery, and the surf has hollowed out plenty of tidy little basins that turn into tidepools at low tide. This is a typical view from the walk along the coast, taken in March. Barely submerged rocks form tidepools at low tide. They also create lots of dramatic waves that make the scene so appealing. You may also see some cute, furry ground squirrels over the cliffs, munching on ice plants and roots, and then disappearing into a burrow. This tide pool is nested in the rocks just outside the Children's Pool breakwater. Built for the children of La Jolla to have a place to play more safely on the beach, this breakwater originally had openings in it to let the water come and go, but after a tragic accident, they were closed. After some years, the sand built up here, making a nice, protected beach. In the 1990s, a colony of harbor seals decided this beach would make a fine nursery, and now they lay on the beach and have their pups here every spring. It all makes for fun watching them but the beach is now off-limits to humans. It's easy to forget about the ocean behind you while you're watching the seals, but if the surf is high, you may get a surprise drenching. Oddly, even though it's in La Jolla, this place is named the Museum of Contemporary Art San Diego. Their collection includes 1960s and 70s minimalism and Pop art, conceptual art, installation art, Latin American art, and art of California and the San Diego and Tijuana region. On La Jolla's commercial streets near the shore, you'll find plenty of boutiques, art galleries, and restaurants. If you have time, you won't find a better stop than Nine Ten at the Grande Colonial Hotel. Their fixed price lunch is an especially good value for money.